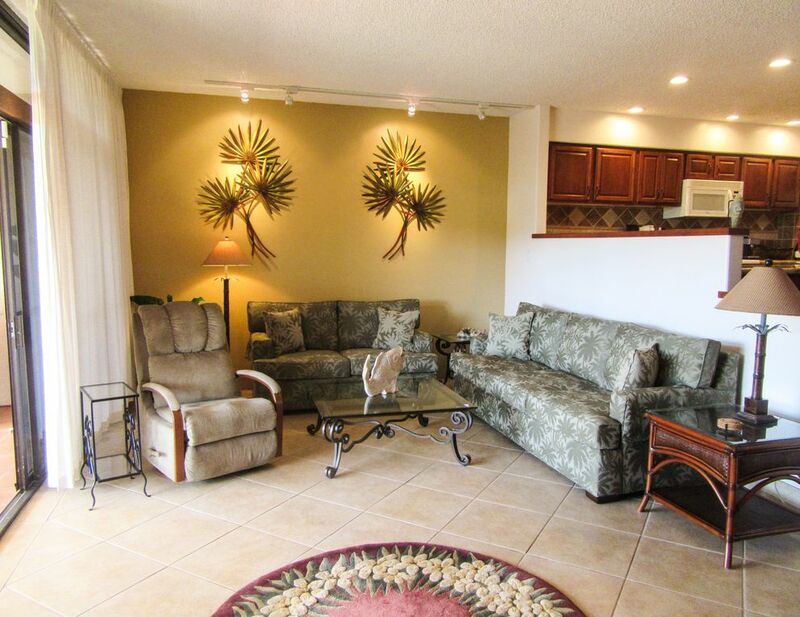 Our 'LUXURY IN THE HEART OF KA'ANAPALI' condominium is owned and managed by the owners, Rod and Debi Conklin and provides guests with 1,635+ square feet of spacious elegance. Less than a 10 minute walk to America's #1 voted beach year after year, Ka'anapali Beach has been named the number one island destination by Conde Nast for over 15 years. We are located in the Ka'anapali Royal Condominiums on the 16th Fairway (K-102) of the world-famous North Royal Ka'anapali Golf Course just north of Lahaina and a 45-minute coastal drive from the Kahului Airport. Our unit is on the ground floor in the K-Building, however, the complex being on a slope, the ground level is actually down a flight of stairs, 17 in all. Unit is not accessible by elevator or wheelchair. Within the unit, there are 3 stairs to the sunken living room and also in the master bedroom. The 2nd bedroom, with no stairs, is on the entry level. Rest assured that Enchanting Maui's tasteful details provide guests with all the comforts of home. New living room furniture arrived in April 2017. The sectional is gone and 2 beautiful new sofas (not sleepers) have replaced it. Our beloved red wall is gone but the new look has given the living room a brighter look. Who doesn't like a spacious Cal King mattress so we've just accommodated ourselves and you as well with one in the Master Bedroom along with brand new furniture. Out with the old, in with the new....Sweet Dreams! The master bath includes a granite counter top w/double sinks, tile flooring and a granite and marble 6'X4' walk in shower - it's a beauty! The second bedroom had a face-lift with all new furniture that can suit your needs either as two twin beds or can be set up as a king. Out with the old and in with new mattresses as well. The guest bedroom also has a Castro Convertible Ottoman which makes into a spacious twin bed that guests have said is wonderful. The 2nd en-suite bath includes wall to wall cabinets, granite counter-top, tile shower and flooring throughout. Also added was not to long ago was a new 32' HD TV. Want to whip up a fabulous meal in the well appointed kitchen with granite counter-top, cookware to meet all your needs, and gadgets galore. In January 2017 we purchased a new refrigerator and range. Our fairly new dining room set now comfortably seats six instead of four. If it's spending time on the water you'll find a bounty of activities to keep you entertained. Deep sea fishing, para-sailing, diving, snorkeling, strolling the beach for that perfect shell or just sitting and taking in the beauty of the ocean and it's own rumbling music, there is a beach activity awaiting your arrival. Looking for more excitement: hike the crater, ride into the East Maui Mountains on horseback, snorkel, paddleboarding or kayaking one of the many quiet inlets, or take a romantic sunset dinner or booze cruise. There are several zip-line adventures to choose from on Maui. There is so much to see and do on the Valley Isle and it's all yours to discover. No need to step outside the condo to find ways to start exploring the Valley Isle and all it has to offer. Our in-house binder will give you a run-down of various activities, places to eat, sites to see and places of worship around the island. If you are a golfer, please mention at the Ka'anapali Pro Shop that you are staying at the Royal. Good possibility that they will offer you a discounted rate on the home courses. A Walk-Fit club is open to the public and a great way to play plenty of golf. For a small monthly fee you can walk the South Course beginning at 4pm and get in as many holes before dark as possible. The rate is from the 1st of the month to the end, no discounted rate for starting in the middle of the month. Enchanting Maui is not just a rental condo, it is our home 4+ months a year so the benefits we enjoy from our time spent in beautiful Maui are yours to enjoy as well. We will consider a rental of less than 7 nights however, the cleaning fee of $280.00 + tax will be charged to you. Our minimum stay is 7 nights unless discussed and approved by the owners. Should you request an early or late check-in/out, please indicate this either on the signed contract or by email or text. If you decide on Enchanting Maui as where you want to hang your hat, I will be in touch with you just as soon as vrbo lets me know that you have accepted our Rental. I will send you both "our" Rental Agreement (fill out all spaces) and House Rules that will both need to be signed by you and returned to me by PDF so we both feel comfortable with the arrangements. All monies will be collected by vrbo but our RA is just a formality for us. Once your final payment is made to vrbo and has cleared the bank, I will send you driving directions and entry instructions. We use a lock box so that information will be included. Most of all, the units are spacious and our location in the complex desirable. We have stayed in several complexes over the years but always found ourselves returning to the Royal. It's central location with Lahaina only a 10 minute drive and Whaler's Village directly across the golf course provides easy access to dining, shopping & of course Ka'anapali beach. A new shopping complex arrived in West Maui in 2010 across from the Lahaina Cannery and improvements to the area are continuing. In 2014, both the Outlet Mall in Lahaina and a Target Store in Kahului arrived in Maui! More shopping options! We are your Hospitality Manager so you will be working directly with us. Rest assured your questions and concerns will be our utmost priority so your time at EM will be care-free. You won't need to stake out a pool chair hours in advance of your plans to enjoy the pool. Our unit being on the lower level has direct access to the pool from the lanai. We provide non-breakable dinnerware and glasses in case you want to enjoy food or drinks at the pool. Remember No Glass, No Smoking! Please remember to return the plastic ware items to the unit. Provided are hair dryers in each bathroom and one 3/4" (19.5 millimeter) curling iron for your convenience. Shampoo, conditioner, body wash and liquid hand soap are provided. Cell phones work great within the unit and most anywhere on the property. Front Load Washer - We provide "HE" laundry soap. If for some reason you need to purchase soap, make sure it is "HE"
One time resort/parking fee of $80.00 paid to complex upon arrival. Eight sets of bath towels. Six beach towels provided for your convenience. We ask that you wash and thoroughly dry the beach towels before your departure. Manuals are provided both in the kitchen for kitchen appliances and above the washing machine for larger appliances. Mini-prep, waffle iron, coffee grinder, rice cooker, and more. Spices, sugar, flour replaced at least 3 times a year and dated when purchased. Complete set of dishes, glassware and silverware for 8+ including outdoor plasticware for the pool area or lanai also for 8. Well appointed kitchen includes Microwave, Bosch Dishwasher, new Refrigerator with ice maker, new Electric range. Always updating small appliances. BBQ with side burner right on the lanai. Seating inside for 6 and there is nothing like dinner on the lanai with seating for up to 8. Books are located in the entertainment center in the living room and there is a library at the pool. Some DVD videos in the unit. Best choice is if you are under 6. We've got Dora dvds. Ugh! For your convenience, we provide 6 beach towels that we ask you wash and dry before departure. "Enchanting" Christmas and New Years with family on "Maui"
We booked our vacation with Deb and Rod almost a year ago. After working with them before our trip, I felt like we knew each other and were old friends. Once we arrived at their "home" we felt like we were home. Everything had been thought of ahead of our arrival. Every kitchen utensil was provided along with any spice you would want. We have stayed at other VRBO units, but Enchanting Maui went above and beyond. Our 9 year old grandson loved the boogie boards that are provided, along with many other beach items that were there for the use. During our stay, the barbeque grills in the pool area were being replaced, but a grill was on the lanai for us to use, just another of the items provided. From the welcome call from Deb after arriving to the follow-up email after we left, everything was great. We look forward to our next trip to Maui and our next stay at "Enchanting Maui". Most comfortable, clean and well stocked place we have ever stayed in! This place is amazing and has everything one could possibly want in a vacation home! I was quite impressed at the owners attention to detail from the lovely decor(love the wood stair nosings), custom labels throughout, detailed instructions, kitchen stock & organization, soft close cabinets, superb washer/dryer, black out curtains in bedrooms and how clean and well maintained the place is. The unit and resort is family friendly with easy access to the pool and green space. We have been coming to Maui for the past 10 years and have stayed in the surrounding resorts and condos so this was the first time staying at this resort. I will definitely be back. Thank you Debi for making our stay one of the best yet. We loved our stay at this condo. It was perfect for our group. Ground floor made getting to the pool easy and the lanai was a wonderful place to enjoy a sunset. It was well outfitted and comfortable. Recommend! The greatest compliment that we can receive is a re-booking and we thank you so very much for that. We strive to make our guests vacation a bit more special and hearing that we did a great job is rewarding. Had a wonderful time. Great location, and amazing accommodations. Quick walk to beach and nearby golfing. Hoping to be able to return someday. Perfect central location with all the comfort of home. The apartment was very well equipped with all the items you need during a vacation here. It was clean and comfortable and Debi and Rod were very easy to communicate with. The apartment is situated very near the main shopping area and beach area. We would definitely recommend this to our friends. We are so pleased that we met your expectations and that everything was perfect . We love having everything right at our fingertips so it's great to hear that it's appreciated. Hope we can be your home away from home again in the future. I would to say, in all my travels to Hawaii you by far have the best unit I have rented. It felt like home. There were basic cooking supplies for us to use. Every time we rent a unit, we would always have to buy salt, pepper, oil, sugar and other spices it was all there. I enjoy grilling and to see one outside with a sideburn was a surprise. Not to mention a kitchen sink outside!! Aloha, glad you're safe back home. Thank you for making us feel like we've accomplished what we set out to do, make everyone feel at home and provide what is basically essential. If every rental we have had to go out and buy S/P, sugar, flour, our cupboard would have to be turned over to the Food Bank. Again, we are so sorry for the a/c issue and it's still being worked on. October can't come fast enough for Rod, and me, so we can get down to what the problem is. Rod has some knowledge about the workings but he is learning a whole lot more. San Francisco has automatic a/c, open the windows and let the fog roll in. He was in plumbing and heating in SF, not a/c. As they say in the islands, if the surf's up, you're likely to find your help at the beach. There is a truck that we've seen which reads., "Not if the Surf's Up" . Get my point! Cute, but not if you're waiting for a repair. Whale Watching is Seasonal. The whales start arriving in late October/early November and grace our waters until the end of April. If you're planning your trip during these months, plan on arranging a Whale Watch with the Pacific Whale Foundation. They are excellent and provide a well-INFORMED whale tour. Definitely worth the money. CONTACT US FOR SPECIAL RATES THROUGHOUT THE YEAR. If convenient, we will grant Early Check Ins or Late Check Outs. First hour is free then a $25.00 fee will be charged for each additional 2 hour time period. The guest who books and signs the Rental Agreement for the unit will be the guest/guests occupying the unit and responsible for any or all damages. Please report any damage or uncleanliness immediately upon arrival as not to be held responsible.